Several weeks ago, I visited all 3 Kirikiri Prisons, including the Maximum, Medium and Female Prisons. My experience that day has stayed with me till now, I remember walking into the Medium Male Prison and thinking it was the most hostile place, I had ever visited, particularly due to its over crowdedness and the look in the hundreds of stares that followed us around as we were given a tour of the Skill and Acquisition Centers in the prisons. It’s where I met one of my Pro Bono clients who is currently in remand at the prison while awaiting Trial. The visit had been coordinated by my friend and Mandela Washington Fellow, Ahmed Adetola Kazeem who is the Executive Director of Prisoners' Rights Advocacy Initiative (PRAI),a non-governmental organization providing pro-bono legal and rehabilitation services to prison inmates, follow the link to read about My Kirikiri Prison Tour. 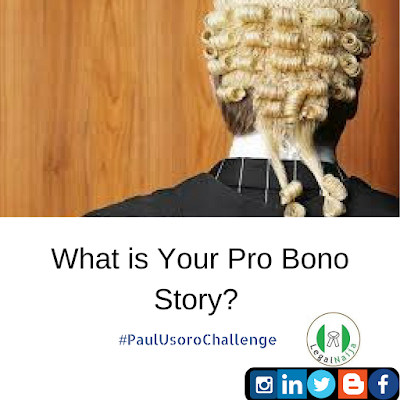 Offering Pro Bono services is a wonderful way for lawyers to give back to the society, moreover, if lawyers were more actively seeking Pro Bono cases, it’s safe to say our Prisons will not be as over -crowded as they are and everyone would have more confidence in the justice system. Currently, my firm Adedunmade Onibokun & Co., is handling the case of an inmate awaiting Trial Pro Bono and I am sure there are various firms and lawyers out there also doing same. Please share your Pro Bono Story with me as well, looking forward to hearing them. They could be on gender related cases, child abuse or humanitarian matters.